Perhaps the following schematic makes it a bit more clear. The schematic shows a VMFS datastore with one extent, on LUN A. If we want to increase the Used capacity, we can do an Expand, on the same extent (LUN A). 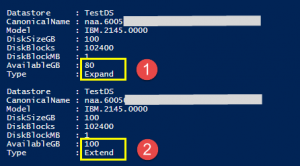 Or we can do an Extend on a new LUN, in this case LUN B.In the case of the Extend, the VMFS datastore will now have two extents, LUN A and LUN B. Note that for the Expand and the Extent you do not need to use all of the free space. The following is perfectly possible. The Increase button presents the user with a series of candidate LUNs. The Expand and Extend candidate LUNs are intermixed in that list. The underlying API method makes sure that the LUNs are not already used by another datastore or by a RDM disk. The module is available in my GitHub VMFSIncrease repository. 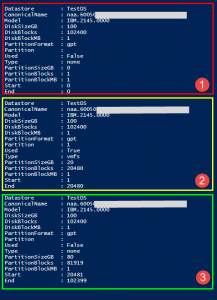 The Get-VmfsDatastoreInfo displays basic information about the extents and the partitions that make up the datastore. The Datastore lives on one extent, and on that extent there are three partitions. The partition marked with (2) is the part where the VMFS Datastore lives. Part (3) is the free space, and part (1) is for alignment. The returned information shows that there are two options to increase the capacity of the Datastore. In (1) we see that we can Expand the extent by 80GB. In (2) we see that we can Extend the capacity by 100GB by adding a new extent to the Datastore. The Help page for the New-VmfsDatastoreIncrease function already contains several examples on how to use the function. But to give you an idea what is possible, just a few examples. We have the possibility to add up to 80GB. If we don’t specify a size, all the free space on the extent is used. If we do specify how much we want to increase the capacity, only that specific amount of space from the free space will be taken. If we have a Datastore that spans more than one extent, we can, through the Canonicalname parameter, indicate on which extent the increase shall be taken. As we explained in the beginning of the post, with the Extend switch we indicate that we want to increase the capacity on a new extent. Again we can take the full extent. Interesting to note, if you don’t specify a LUN, through the Canonicalname parameter, the function will order the available LUNs alphanumerically on their Canonicalname, and take the first one. So the following is perfectly possible, provided of course there are free LUNs available. And, as with the Expand option, you do not need to use all of the available space with the Extend option. You can control how much space is taken through the IncreaseSizeGB parameter. The option is also available without specifying a LUN. The function uses the same logic as was mentioned before, it will order the available LUNs alphanumerically on their Canonicalname, and take the first one. Since a couple of days the long awaited PowerCLI Community Repository is live! More info can be found in the Updating the VMware PowerCLI Community Repository! post over on the PowerCLI Blog. If you have any scripts, functions, modules… that might be useful for the community, please submit them there. The VMFSIncrease module will be available on the PowerCLI Community Repository shortly.